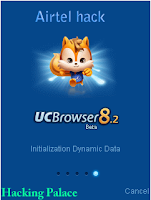 After fixing a lot of Bugs, HackingPalace presents new UC Browser 8.3.2 modded for Airtel free GPRS and 3G for July 2012. Now it supports downloading all formats with high speed. In the old version 8.3 released in MAY had download support only for some specific extensions (it wasn't supported EXE and MP3) . Also It wasn't working in some states. Now I checked this new UC in many states and found to be working in many places in India. It also supports 3G speed. Also fixed errors on downloading large files and Image loading bugs. Enjoy free 3G/EDGE/GPRS in Airtel! Read instructions below. Enjoy unlimited Internet on Airtel with high speed with downloading support.